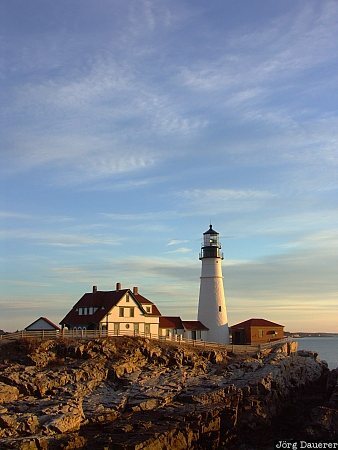 A few clouds and blue sky above Portland Head Lighthouse at Cape Elizabeth illuminated by warm morning light. Cape Elizabeth is in southern Maine near Portland at the east coast of the United States. This photo was taken in the morning of a sunny day in March of 2006. This photo was taken with a digital camera.